Easter carnival games should provide mild competition and maximum fun for kids and parents celebrating the spring holiday together. Lots of candy and Easter-related prizes will add to the delight with each game you choose to include in the carnival. Make the games simple and include consolation prizes so no one leaves empty-handed. Include an ever-popular Easter egg hunt on or near the carnival grounds as the main event to either open or conclude the carnival. Create a Scrambled Eggs memory game with plastic egg containers of many different colors. Fill the egg containers with candy and other Easter prizes. Make sure you have an even number of egg containers of each color. 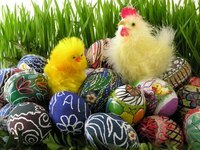 Place the eggs into an oversized Easter basket with grass, hay, straw or plastic grass covering them. Each player reaches into the basket to dig out two eggs. If the eggs' colors match, the player gets to choose one of the eggs to keep. Give each player three chances to make a match. If no match is made, give the player a consolation prize. After each player finishes, mix up the eggs in the basket to make the game fair. Bean bag tosses can be easily adapted as an Easter carnival game idea. Use thick cardboard or plywood to create a life-sized Easter Bunny with a large smiling mouth. Decorate bean bags to look like Easter eggs. Give players three chances to throw the bean bags into the mouth of the Easter Bunny cutout. Have three different levels of prizes for players who get one, two or three bags into the target. Include consolation prizes for kids who miss all three times, or allow them to keep playing until they get a bean bag into the Easter Bunny. Alternately, create bean bags filled with candy and give them away as prizes to players who toss them into the Bunny. Bunny's Eggs is an Easter carnival game variation of the traditional Pin the Tail on the Donkey game. Create a life-sized image of the Easter Bunny on a large sheet of paper or cardboard. Cut out about 25 eggs from sheets of colored construction paper. Put double-sided tape on the backs of the eggs just before players take their turn. Players are blindfolded and then spun in circles slowly before they attempt to tape the eggs on to the arms of the Easter Bunny. Give the main prizes to players who successfully tape the eggs on the arms of the Bunny, and give consolation prizes to everyone who plays.